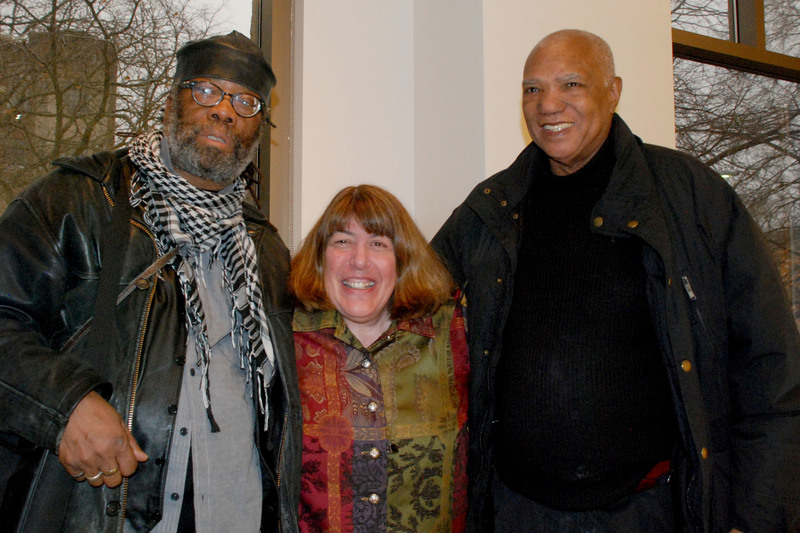 George Bailey, photographer Nancy Ortenberg and blues poet Sterling Plump . Noting this news here partly is self-serving: Tonight, this blogger will participate in a chat entitled “Who Needs Gatekeepers? Music Criticism in the Digital Age” with Val Camilletti of the legendary Val&apos;s Halla Records. (The fun starts at 7 p.m. in the Main Library Veteran’s Room, and admission is free.) But this is far from the only noteworthy event. My Columbia College Chicago English Department colleague, friend and celebrated jazzbo George Bailey has been leading discussions of some great music films on Tuesday nights at 7 as part of the series. Still to come: High Lonesome: The Story of Bluegrass Music on March 5; Plugging In, episode six of The History of Rock ’n’ Roll on March 12, and Bridges, episode one of Latin Music USA, and From Mambo to Hip Hop: A South Bronx Tale on March 19. The library also has a series of Monday afternoon films, including What’s Love Got to Do With It? at 1:30 today and Coal Miner’s Daughter at the same time on March 11. For teens, there’s an open mic night on March 15 and a spoken-word performance hosted by Kevin Coval of Louder Than a Bomb on March 20. Other live discussions include “Eccentric Soul” hosted by the local indie label the Numero Group on March 27, and the performance schedule features blues-funk-soul-rockers the Fuzz & the Fury at 3 p.m. on March 16 and square-dance band Golden Horse at the same time on March 30. Oh, and through it all, Oak Park resident Nancy Rose Ortenberg will be displaying her incredible photos of the musicians of the Mississippi Delta in the library’s gallery. For more information on the series, visit oppl.org/americas-music.